Details : Ht 26" TET. Ev. E-M. Re. Bl. 5½"
A gorgeous burnt orange with a red eye and red petal edge. Excellent branching and bud count. Fast increaser. Limited stock. Details : Ht 24" TET. Ev. E. Re. Bl 6"
Large peachy orange with a large red eye and picotee edge and a green throat. Details : Ht 27" TET. Dorm E Re. Bl 3.75"
Not a miniature but a small flowering daylily. Golden orange with red eye and edge. Green throat. Wide, round and consistently beautifully formed. A strong rebloomer - many blooms. Details : 30" Ev. Tet. E. Re. Bl 5.75"
Apricot self with green throat. Round and ruffled 30+ buds Great Performer. Aussie Fireworks - New! Exclusive to R.B.D & I. Details : Ht 29" TET. Ev. E-M Re. Bl 9" as standing. Spider variety. Curly with exploding bright colours of orange and a bright red eye with a large yellow green throat. All petals & sepals are curled. A gorgeous performer. A favourite in spiders. Aussie Flaming Beauty - Exclusive to R.B.D & I. Details : Ht 38" Ev. TET. M Re. Bl 7.5"
Large blooms of rich mango orange with a bright reddish centre. Crimped ruffled egdes. Doubles 10% of the time. Limited stock - 1 per customer. Details : 26" Ev. Tet. E - M. Hyb. Re. Bl 6- 7"
Details : Ht 28" TET. Ev. E-M Re. Bl 5"
Bright orange red, ruby red eye, green throat. Ruffled flat form. Many buds, 5 way branching. Neat and tidy blooms. A light apricot polychrome with pink highlights, green throat. Great substance, shape and form with ruffles. Limited stock - 1 per customer. Details : Ht 24" TET. S.Ev E-M Re. Bl 5.75"
Tangerine cream with a large red eye and edges, Limited stock. Details : Ht 26" TET. Ev. Mid. Re. Bl 5"
Autumn colours of persimmon, coral, rose with a gold apricot centre. Details : 24" Dor. Dip. M-L. Re. 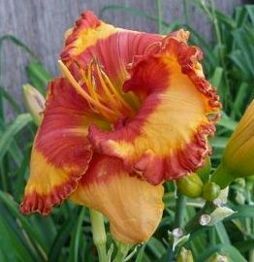 Bl 5"
Shiny blooms of bright light tangerine with a radiating gold throat that blends into the petals. Nicely ruffled flat-opening flowers. Puts on a good show. Details : 24" Ev. Tet. M Re. 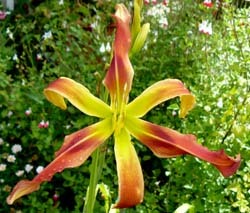 Bl 6"
A lovely orange with red eye petal edge. Full, round and nicely ruffled. Hardy. Limited stock. Details : Ht 46" Dip SEv. E-M - SEv RE. Bl 9.5"
Burnt rose with a darker rose eye and with an extended green throat. The flower segments twist and turn gracefully. 5 way branching. Limited stock - 1 per customer. Details : 22" SEv. Tet. E-M Re. Bl 5.75"
Intense saturated coloured blooms of tangerine orange. Heavily ruffled and rounded of great substance. 35+ buds. Great for hybridising. Limited stock - 1 per customer. Details : Ht 24" TET. Ev. E-E Re. Bl 5"
Orange with a bright deep shimmering red eye. Orange with a light blend of rose and a white midrib. Large and ruffled. An old favourite. Details : Ht 26" TET.Ev. M. Re. Bl. 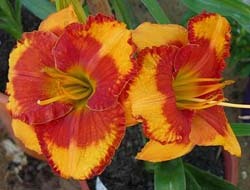 5.½"
Hot orange-red blooms that have wide, opened, crimped petals with a small gold heart. Limited stock. A bright orange bloom with red eye. Round, ruffled and recurved. Popular. A stand-out in the garden. Limited supply - 1 per customer. Details : 35"Dor. Triploid. E-M-L Bl 5"
Details : 26" SEv. Tet. M Re. Bl 6"
Pink, orange and gold blend with edging of gold knobs and hooks. Limited stock - 1 per customer. Details : Ht 19" Dip. S.Ev. Re. Bl 3"
A crepe testured ruffled bright orange with veining and a darker orange eye. Lovely rounded blooms. Details : 20" Ev. Dip. E. Re. Bl. 4.5"
Details : Ht 38" TET. S.Ev E Re. Bl 8"
A reddish orange bitone with a green throat. Details : 28" SEv. Tet. M-L. Bloom 5"
Brilliant tangerine with a slighter darker eye. A piecrust edging. Large wide and ruffled. A beacon in the garden. Prolific. Details : Ht 33" TET. Ev. E. Re. Bl:6.5"
Orange with red eye and matching wide ruffled edges. Great form. A favourite. Limited stock - 1 per customer. Details : Ht 30" EV. TET. M Re. Bl 7.25"
Huge blooms of clean orange with a bright red eye and wide braided ruffled edge. Many blooms out at once. A standout! Limited stock - 1 per customer. Details : 28" SEv. Dip. M. Bloom 7"
This bloom is a bonus staying open for 2 days, thus making it a clumped bloom display! On the first day the blooms are bright orange red and then turns to a rich dark orange. Robust, full and rounded. Limited supplies - 1 per customer. Details : Ht: 26" Ev. Tet. M. Re. Bl. 3"
Ruffled, rounded delicate peach with a rose eye pattern and a green throat. Blooms displayed on tall scapes for a mini. Looks lovely displayed clumped up in a tub or background garden filler . A lovely orange with a neat red eye and a large green throat. Large ruffled blooms with lots of appeal due to it's clarity of colour and colour pattern. Gorgeous. Limited stock - 1 per customer. Details : Ht 28" TET. SEv. E-M Re. Bl 5½"
A ruffled deep clear orange sherbert with olive-green throat. Nice substance and form. Details : Ht 28" TET. Ev. M. Re. Bl 5.½"
A heavy substanced incomparable orange blend with darker large ruffled edges. Olive green throat. An excellent and fancy bloom. Details : 28" Ev. Tet. M. Re. Bl. 6"
Fiery orange-red with a deeper eye. Yellow throat. Limited stock - 1 per customer. Details : 30" Tet. Ev. Re. Bl.7"
Bittersweet orange with light red eye. Big, flat, brilliant blooms. Limited stock. Twisted Tails - New! Exclusive to R.B.D & Irises. Details : Ht 25" TET. Ev. M Re. Bl 10" as standing. Was $80. now on sale for half price until stock runs low. Elegant vermilion orange with a faint red flush band. Lime throat extending into a large gold centre. Cascading, twisted and pinched crispate.